West Sussex County Council (WSCC) has been accused of a ‘betrayal of local people’ over plans for the former Novartis site in Horsham. James Walsh, leader of the Liberal Democrat group, said the council had abandoned its much-vaunted plans for a world-renowned science park on the site, opting instead for a mixture of homes and offices. Dr Walsh (Lib Dem, Littlehampton East) spoke out after the press and public were excluded from part of a meeting of the performance and finance select committee on Monday (July 9) during discussions about a proposed outline planning application for the site. Novartis left the Wimblehurst Road site in June 2014 and it was bought by the council in December 2016. 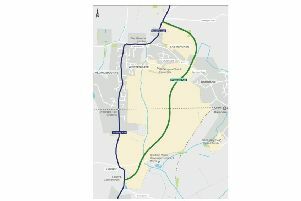 When asked why the original plans had been downgraded and if any part of the site would be used to house a science park, a council spokesman said: “We continue to look into options for the redevelopment of the former Novartis Pharmaceuticals site in Horsham and proposals are being progressed. “It is anticipated that a planning application for a mixed-use scheme on the site will be made later in the year which will include Grade A office space to support the maintenance of high-quality employment at the location. The northern part of the site was sold by Novartis to developers for 160 homes. Dr Walsh said any housing built on the site needed to be ‘at least 30 per cent truly affordable social housing for key workers’ and called for more public open space and more car parking. He also wondered if the council faced a ‘real risk’ of a financial loss on the site, asking how much it had cost in terms of security charges, consultant payments and officer time. The spokesman added that a meeting for invited representatives from the local community would be held later this month, and that formal public engagement events would be held before an outline planning application was submitted to Horsham District Council later this year. This was a view shared by Mrs Goldsmith, Sue Mullins (Lab, Northgate & West Green) and Steve Waight (Con, Goring) during the performance and finance select committee, who all told chairman Pieter Montyn (Con, The Witterings) that they felt the issue should have been heard in public. What do you think? Send your thoughts to our letters page.